ARME Realty.com releases new cheap video marketing programs for real estate professionals nationwide. A Clearwater FL based real estate marketing firm just released their latest cheap video marketing programs for real estate agents. The company states that for as little as $5 per video, real estate professionals around the Clearwater FL are or anywhere else the country, real estate pros can now showcase their virtual tours in digital style. A recent joint study done by the National Association of Realtors and Google shows that Youtube is the top video research destination for home shoppers. Over 51% of potential home buyers turn to Youtube for property research, and internet savvy brokers everywhere are taking advantage of this simple fact. A company spokesperson states, "Google's recent findings indicate that the trend is looking strong for Youtube marketers. Real estate professionals who are not marketing their Youtube videos or marketing their virtual tours on Youtube are missing out on a cheap but effective avenue from which to draw in new home buyers. It's a crucial part to any marketing strategy." The company is located in Clearwater FL and services real estate professionals nationwide. Their Youtube channel Youtube.com/armerealty showcases the quality of their videos and the company offers 30 second marketing videos for as little as $5. The company states that this price point is perfect for realtors on a budget who want big results for little money. 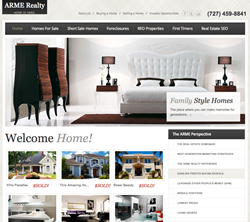 For more information about ARME Realty.com and their cheap video marketing programs for real estate brokers contact the company at (727) 459-8841.